Sri Sultan Hamengkubuwono IX Born in Yogyakarta, 12 April 1912 under the name Raden Mas Bendoro Dorodjatun in Ngasem, he was one who had led the Sultan of Yogyakarta Sultanate (1940-1988) and Governor of Yogyakarta Special Region's first post-independence Indonesia. He served as Vice President of Indonesia is the second between the years 1973-1978. It is also known as the Father of Scouting Indonesia, and has served as Chairman of the national scouts. Hamengkubuwana IX is the son of the Sultan and Prince Maya Hamengkubuwana Kustilah VIII. At age 4 years Hamengkubuwana IX lived apart from his family. He obtained his education in Yogyakarta, Semarang MULO, and AMS in Bandung. In the 1930's, he enrolled at Rijkuniversiteit (now Universiteit Leiden), Dutch ("Sultan Henkie"). Hamengkubuwana IX was crowned as the Sultan of Yogyakarta on March 18, 1940 with the title "Dalem Sampeyan Ingkang Sinuhun Kanjeng Sultan Hamengkubuwana Senapati-ing-Ngalaga Abdurrahman Sayidin Panatagama Khalifatullah ingkang Jumeneng Kaping Sanga". He was the sultan who opposed Dutch colonialism and promote the independence of Indonesia. In addition, he also pushed for the government of Indonesia gives special status to Yogyakarta with the title of "Excellent". Before crowned, 28-year-old Sultan negotiate tough for 4 months with senior Dutch diplomat Dr. Lucien Adam on the autonomy of Yogyakarta. In the old Japan, the Emperor forbade romusha delivery by organizing local projects Mataram Ditch irrigation canal. Sultan Paku Alam IX with the first local authorities to merge into the Republic of Indonesia. Sultan also who invited the President to lead from Yogyakarta after the Dutch occupied Jakarta in Dutch Military Aggression I. The role of Sultan Hamengkubuwana IX in General March 1, 1949 attack by the military is still not synchronized with the version of Soeharto. According to the Sultan, she who saw the fighting spirit of the people down and encourage the general attack. Meanwhile, according to Pak Harto, he had met Sultan even after the handover of sovereignty. Sultan to use his personal funds (from the palace of Yogyakarta) to pay the salaries of the republic who did not receive a salary since the second military aggression. Since 1946 he has served several times a minister in the cabinet of President Sukarno. His official position in 1966 was the Chief Minister is in the field of Economy. In 1973 he was appointed vice president. At the end of his term in 1978, he refused to be re-elected as vice president for health reasons. However, there are rumors saying that the real reason he resigned was because it did not like President Soeharto's repressive as the event Malari and drift on the CCN. He attended the celebration of 50 years of rule by Queen Wilhelmina in Amsterdam, Netherlands on Sunday night in 1938 October 2, 1988, he died at George Washington University Medical Centre, USA and was buried in the cemetery of the sultan of Mataram in Imogiri, Bantul regency, Yogyakarta, Indonesia . 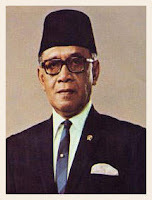 Sultan Hamengku Buwana IX was recorded as the longest serving governor in Indonesia between 1945-1988 and King of the Sultanate of Yogyakarta longest between 1940-1988.